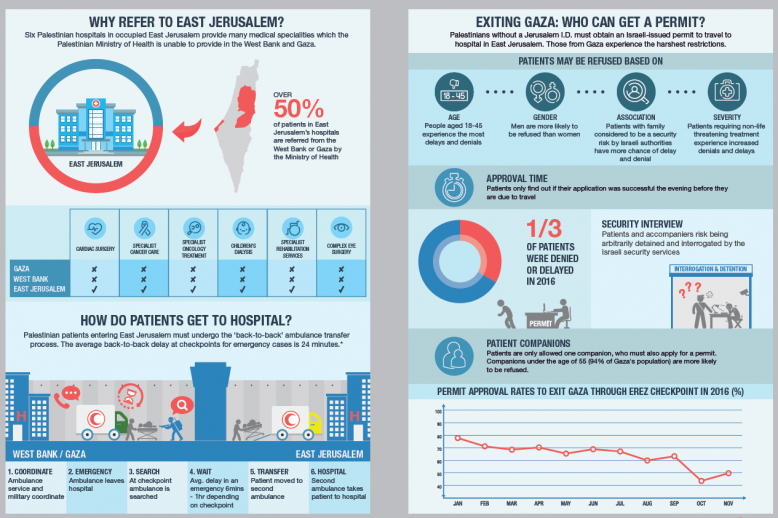 The latest infographic from Medical Aid for Palestinians (MAP) and Physicians for Human Rights – Israel (PHRI) explores how Israeli Government’s restrictions on freedom of movement are putting the lives of Palestinian patients at risk. Many patients from the West Bank or Gaza need to travel to East Jerusalem for specialist medical care unavailable elsewhere in the occupied Palestinian territory (oPt), such as cardiac surgery and specialist cancer care. 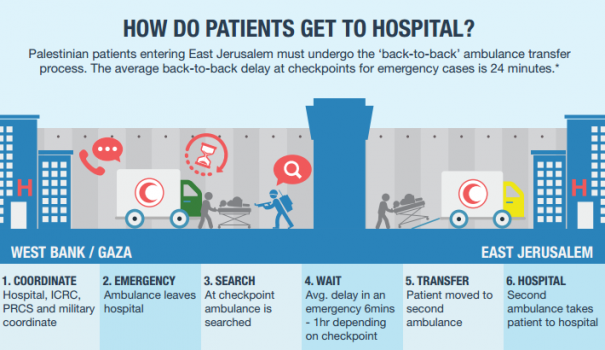 However, barriers to freedom of movement are preventing and delaying patients from accessing urgent treatment in East Jerusalem: both due to delays to ambulances entering the city, and a restrictive system of permits. As visualised here, those requiring urgent treatment at hospitals in occupied East Jerusalem are systematically forced to transfer from Palestinian ambulances to Israeli-registered vehicles at checkpoints. This ‘back-to-back’ process is enforced even in critical and emergency cases, and can cause life-threatening delays. Data collected by the Palestinian Red Crescent Society (PRCS) between October-December 2015 showed that this process took an average of 24 minutes during emergency cases. Palestinians without a Jerusalem I.D. must obtain an Israeli-issued permit to travel to hospital in East Jerusalem. Our infographic shows how Palestinians living in Gaza experience the harshest restrictions, with the number of permits issued by Israel to patients needing to exit Gaza for medical care falling to a record low in 2016. 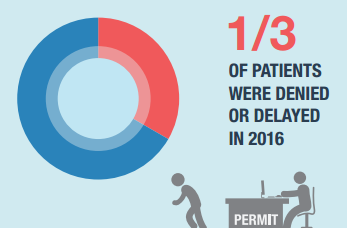 Last year one third of patients were either denied or delayed permits to travel, interrupting care and endangering recovery. With the Rafah crossing with Egypt closed for most of the year, exit via the Erez crossing into Israel is vital for patients. Under international law, Israel is responsible for ensuring access to adequate medical treatment for the occupied population under its control. MAP and PHRI are jointly calling for the Government of Israel to remove obstacles to movement and an end to the occupation of Palestinian territory and closure of Gaza. June will mark 10 years of blockade and closure in Gaza and 50 years since Israel’s occupation of Palestinian territory began. This infographic is the first in a series from MAP this year highlighting the effects of prolonged occupation on the health and dignity of Palestinians.